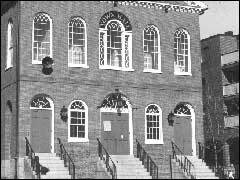 In addition to the Salem Custom House, which is treated separately, this section of the Website presents images and information on the government buildings in Salem listed below. In some cases the buildings are related to Nathaniel Hawthorne; in other cases buildings are included to give a sense of Hawthorne's world and also of the Salem a visitor would encounter today. All of these buildings also appear on the 1840 and/or modern map of Salem. All of these buildings also appear on the 1840 map of Salem.